In the early part of this year, Alice set off for the Masai Mara on a riding safari with renowned guide Tristan Voorspuy who has run Offbeat Safaris for over two decades. She reports here on what was one of the highlights of her African travels so far. After hearing many stories of Tristan’s wildly exciting riding itineraries across Kenya’s Masai Mara, I was just a little nervous about joining this trip. Would I, I wondered, be racing with game flat out across the plains, falling down holes, jumping massive bomas, and tumbling exhausted out of the saddle after riding for seven hours a day? Well, yes, some of that, but the way the whole trip was put together made it one of the best and most exciting things that I have ever done. It’s very rare that I don’t enjoy an African trip but it’s also very rare that I sob all the way back to the airport at the end which was the case this time. Tristan is a little eccentric, but he is one of the best guides I have ever been on safari with. Not only is his knowledge incredible but he really feels strongly about the fragile ecosystem in Kenya and his role is in the whole environment. He is passionate about horses and wildlife and I found his enthusiasm unbelievable after his 25 years in the business. 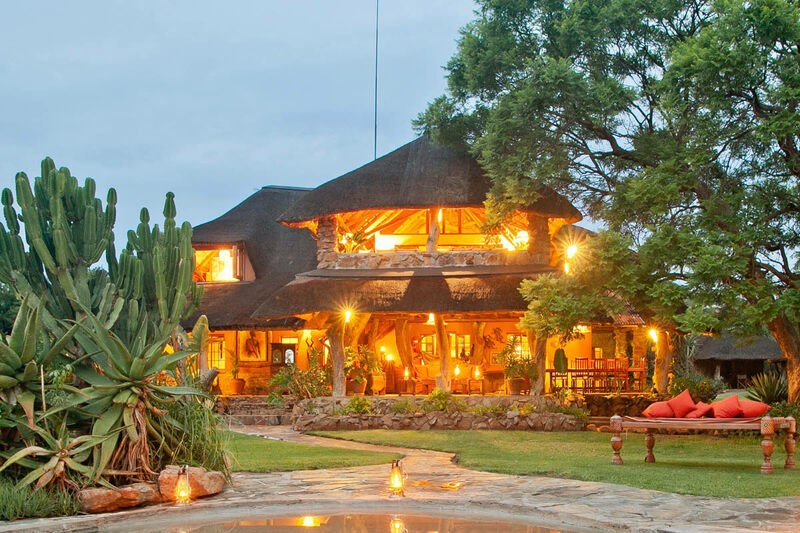 Each night on safari, you are based in a mobile camp that moves every two or three days. The tents are simple with camp beds and your own loo close by, and there are a couple of bucket showers which run at any time of day. Everything you need is provided but there are no unnecessary frills. The food was also very good – a huge breakfast then either salads or sandwiches for lunch and a big supper every night. Daily activities are dictated by whether it is a moving day or a camp day. On the moving days you cover the distance to the next camp (30 or so miles). There are stops for wildlife along the way and plenty of long canters in open areas. Everyone has their own saddle bag to carry water and lunch and there is a long couple of hours’ stop to eat and snooze under a shady tree, chosen for its good view or proximity to waterhole. The riding on these days is fairly easy going, but it’s up to seven hours in the saddle. By contrast, the camp based days provide lots of fun, exciting riding. 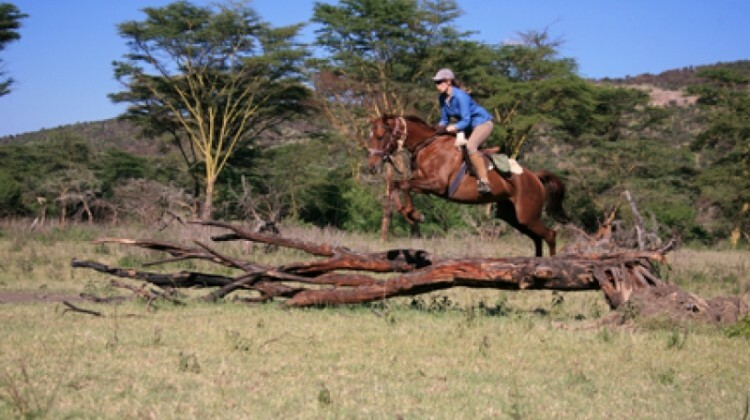 We rode both morning and evening, with great game viewing and exhilarating riding with plenty of fast cantering and jumping – which is optional but good fun and mostly over fallen trees and ditches. The really entertaining thing about these camp based days is that every day was different, some days there was no riding in the afternoon and Tristan would organise picnics by the river or walks or village visits. Each night there was a night drive and we saw masses. 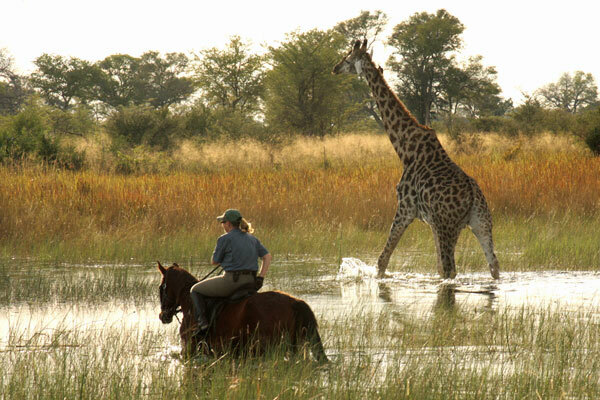 From horseback we saw giraffe, two lots of lions, elephants, hippos, buffalo, zebra, topi, hyena, Thompson and Grant’s gazelle and impala. At other times we saw cheetah, serval, and crocodiles. The birding was also excellent. The horses are fit and tough and you need to be a competent rider and confident at all paces to get the most out of these trips. It isn’t a trip I would recommend for inexperienced riders. I had a chestnut mare called Mad, which didn’t instill much confidence to begin with, but she was lovely to ride, would take her own line, go first through any rivers or woodland and had an honest jump. 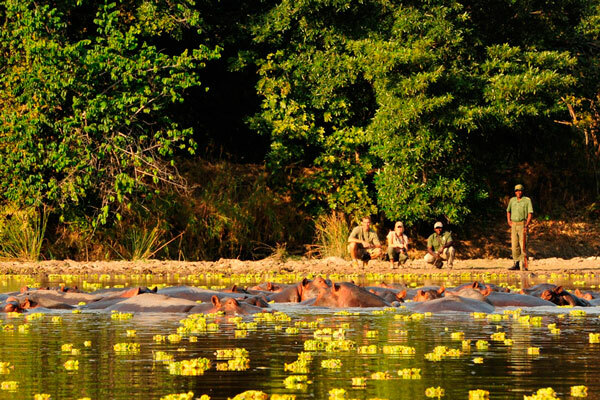 I think the reason I enjoyed myself so much was the true safari nature of the trip. 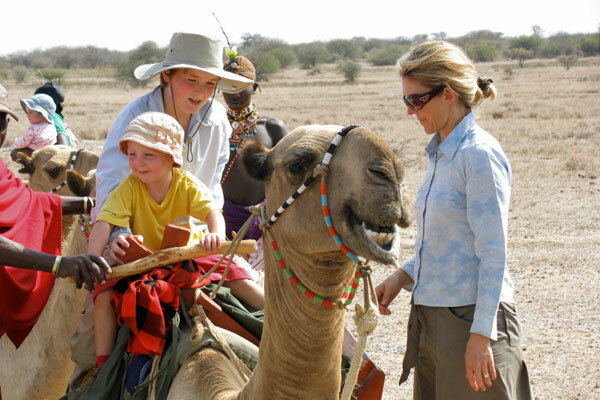 I loved moving from place to place using horses as our means of transport, and although we explored the immediate areas around each camp with the horses, we also did so many normal safari activities to break up the riding. The walking, swimming and day and night game drives added to the huge variety which only made me look forward to the riding all the more. It was a really perfect balance. Tristan is very good at what he does and a superb horseman. He’s very good company, both completely politically incorrect and a bit eccentric which I found very refreshing. All in all, a superb trip which exceeded my expectations and for an experienced rider I would highly recommend it.